Description: Bushy perennial plant. Rhizome is light yellow outside, white from within, containing milky, bitter juice. Chicory radix is used best during autumn. During that period it has the highest level of inulin. It has lanceolate leaves, coarsely toothed near the bottom. Flowers are white to light blue and lavender, toothed at the ends. Flowering occurs from July to October. Medicinal use: Whole plant, especially root, contains volatile oils, which produce high toxicity to internal parasites. 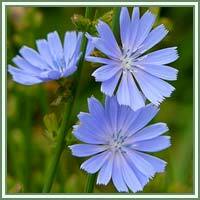 Chicory is used as a tonic in the treatment of gallstones, gastro-enteritis, sinus problems, cuts and bruises. Inulin, the dietary fiber found in chicory is a helpful ingredient in treating diabetes and constipation. 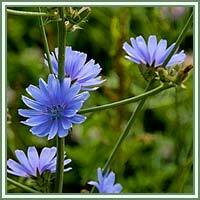 Chicory is also often recommended for jaundice and spleen problems. The juice made of leaves and a tea made from the blooming plant help the release of gallstones, elimination of internal mucus and production of bile. They are also useful for gastrointestinal problems: digestive difficulties, gastritis and lack of appetite. Safety: There are no known safety precautions. Still, some herbs could react with certain medication. Therefore, it is advisable to consult your doctor before consumption of any herb.